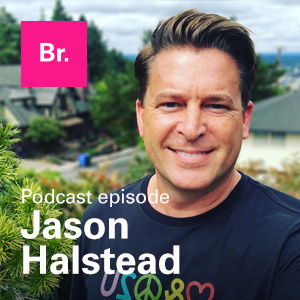 Posted by jason on May 9, 2018 in Insights and tagged articulation, brand, branding, business, positioning, strategy. I’m always wishing there were more opportunities for interesting conversations about rebranding and brand strategy, and the key intersection of design and business. Apparently I’m not alone. Belgian podcaster Stef Hamerlinck stumbled across my Brand Spectrum infographic via Google and asked me to come on his show “Let’s Talk Branding,” to be interviewed about the model I use and specifically about one of his own obstacles, the difficulties and challenges of brand positioning for clients. Stef had more questions, and I had more tips and insights, than our time would allow. It’s a value-packed one-hour episode that cracks open the brain of a brand strategist and gives you a look inside. And the content is just as relevant to a business leader or someone debating rebranding, as it is to a designer wanting to learn how to make their creative work more strategic and more valuable. Give it a listen right here. Here are some time codes that can let you fast-forward to the juicy bits. And here’s a little brand positioning freebie for you. You can also download the free Intro to Value Proposition Worksheet that I provided to Stef to accompany the podcast. If you start exploring and working through your own value proposition and positioning and need some help, get in touch. It’s not the easiest work to do, especially if you’re new to the concepts. But if you stick with it and do the hard work, it pays off in spades. Are there things you’d like to know about branding that could be part of a future branding conversation? Let me know. You can download the episode for the road or subscribe to the “Let’s talk branding” podcast for more information on Stef’s future episodes. © 2019 View Design, Inc.